We deal with various client requests on a daily basis, so we are well aware that the more you can customize your fund factsheets the better. Today we would like to present another feature which is aiming to give our clients more control over what is displayed in their tearsheets. You might have noticed that when you preview your report, there are small black icons present in the top right corner of each section. Both of these icons allow you to customize the sections. We have talked about the pen icon in one of the previous articles so lets focus on the settings icon (cogwheels). Clicking on this icon opens a settings dialog where you can select what items are displayed in this particular section of your factsheet. Would you like different statistics displayed in the risk statistics table? Or would you like to alter information in the general information table? 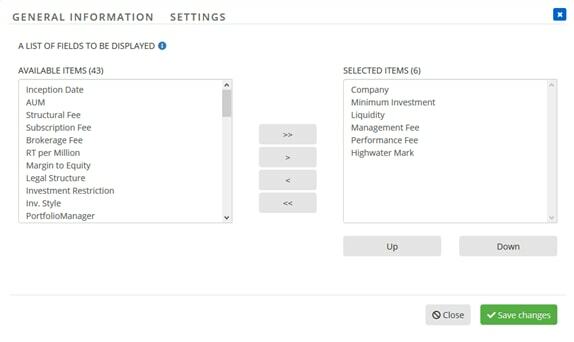 Simply click the settings icon and select which items are shown. You can also change the number of benchmarks being displayed in charts. And there is even more in tables – set calculation methods, show additional columns or time periods and adjust other settings such as the color of negative numbers, order of rows and so on. The number of options available may be a bit different from one section to another, so we suggest that you try them all.